Albertosaurus libratus and Corythosaurus casuarius by Josef Moravec. Original oil painting 30" x 24"(76 cm x 61 cm). (Framed). ALBERTOSAURUS libratus was a theropod, a member of the family Tyrannosaurids. Albertosaurus belonged to the more fearsome predators of Cretaceous period. Its name means "lizard from Alberta", because many fossils have been found in Alberta, Canada. This smaller tyrannosaurus was similar to the Tyrannosaurus rex, though it roamed some eight million years before. Albertosaurus was a fierce hunter, a carnivore. It probably ate plant-eating dinosaurs, probably the carcasses of dead animals as well. It swallowed flesh in large chunks, without chewing them. Albertosaurus was one of the fastest runners among the tyrannosaurids. It was bipedal animal, like all tyrannosaurs. Its strong hind limbs were long and powerful, each foot had three toes with large, sharp claws. Its front limbs had two fingers and were too short to reach its head; the function of its small arms is not known. Albertosaurus had a large head, strong and muscular neck and a long tail. It possessed a wide muzzle on its large skull, lined with sharp, long, saw-toothed teeth, suitable for meat eating. Its teeth were perfect for tearing flesh and its powerful jaws were used to rip carcasses apart. TIME - 76 - 68 MYA, Late Cretaceous period. CORYTHOSAURUS casuarius was a crested duck-billed dinosaur, with a crest that was shaped like a plate. 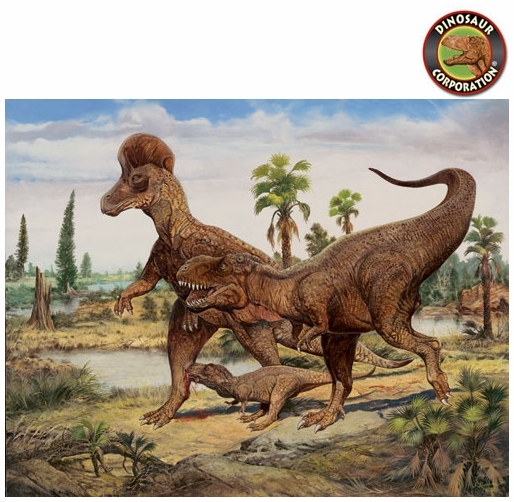 The name Corythosaurus means"helmet lizards". Corythosaurus is one of the best-known hadrosaurs thanks to the discovery of complete skeleton in 1912. It was a herbivore, that dined mostly on palm leaves, pine needles, fruits and seeds. Corythosaurus was a well adapted herd animal, it may have migrated from coastlines to higher places to reproduce. Corythosaurus was a quite fast animal, it was a good runner as well as good swimmer. It walked and ran on two legs, but it may also have walked on all four limbs to reach low-lying plants. It had short arms and long, heavy tail. Its hind limbs were much more longer than its arms. The Corythosaurus is characterized by a spectacular crest on the top of the head, that may have been used for mate display, to make sounds, as a sense-of-smell enhancer or as a cooling device. It is recognized, that males had larger crests than females. Its nostrils went up through the crest. Corythosaurus had toothless beak and hundreds of cheek, small and sharp teeth in its jaws. Its teeth were used to grind up its food, abrasive plants. Corythosaurus is one of the best known of duckbilled dinosaurs and it is quite prevalent in the North America fossil record. There have been many fossils discovered in the some places in Western North America, suggesting that Corythosaurus travelled in groups. TIME - 75MYA, Late Cretaceous period. DIET - These herbivorous browsers fed on pine needles, magnolia leaves, seeds, and various other plants as well as fruits. SIZE - 40 ft (12m) long. WEIGHT - Adults weighed up to 5 US tons. Albertosaurus hunting Corythosaurus. Printed on premium photo quality super "B" paper 13" x 19". Oil painting by Josef Moravec. The painting is in the art collection of Dinosaur Corporation. Dinosaur Picture. What dinosaur-themed room would be without Albertosaurus and Corythosaurus? Dinosaur photographic art print in 14" x 17" frames, double matted in glass. Albertosaurus hunting Corythosaurus. Cretaceous dinosaurs. Reproduction of original oil painting giclee on canvas. Albertosaurus libratus, Corythosaurus casuarius - oil painting by Josef Moravec. Note: Watermarks and Copyright markings do not appear on the final photo quality giclee on canvas.